Henro (pilgrim) sign on the 88 Temple Pilgrimage. A few weeks ago, I got an e-mail from Wayne Emde. He’d found my blog through The Camino Documentary, he said, and he was one of the pilgrims director Lydia Smith had mentioned in my interview with her. Wayne didn’t know I was Canadian, but he said that he and his friend Jack, an Anglican priest who’s also in the documentary, have done Camino presentations a few hours away from where I’m living. Wayne Emde, on his way to Temple 13. When I wrote back, I asked where he was. It turned out he lives only an hour away from me. And we have more in common than geography. We studied history at the same university, and have both worked as journalists. He used to teach photography and I studied photography near to his hometown. So of course we had to meet. Wayne and Jack came out to Kamloops, and we spent nearly three hours in a café, talking about the Camino Francés, the Vía de la Plata, and, particularly, the Shikoku pilgrimage in Japan, which Wayne walked in 2008 with his eldest son, Jason. On the 88 Temple pilgrimage. Wayne didn’t know much about Buddhism and had never heard of the Shikoku pilgrimage when he flew to Japan for Jason’s wedding. But when Jason told him about the pilgrimage and invited him along, Wayne felt something in the journey calling to him. The two of them spent seven weeks walking 1200 kilometres around the perimeter of the island of Shikoku. They visited each of the eighty-eight temples sacred to Kobo Daishi (“Great Teacher”), the man who brought Shingon Buddhism from China to Japan in 806. The temples are strung out along the route, some in clusters and some on their own. Sometimes the pilgrims visited five or six in a single day; at other times they had to walk eighty or so kilometres between temples—several days’ worth of travel, since they averaged twenty-four kilometres per day. A Buddha along the way. In the mornings they walked together and talked—about everything from Bob Dylan and books to their worries and dreams to their family and its history. They walked separately in the afternoons. In the evenings they usually camped, but every three or four days they would stay in a hotel or minshuku (bed and breakfast) or occasionally in a temple, so they could have showers and do laundry. There weren’t formal campsites, Wayne said. He and Jason would usually just stop wherever they happened to be when the day ended. Sometimes it was in a city park, a beach, a shrine, or a mountainside. … It was really amazing that at the end of the day, someplace to pitch our tents would reveal itself to us. They carried about thirty-five pounds each in their backpacks. And the walking could be difficult—the terrain was a lot steeper than was usual on the Camino Francés. Henro (pilgrims) mainly walk on highways, Wayne said. But when the path led inland to some of the mountain top temples, it was usually a well-trod trail. Mountains were very, very steep, and many of the paths had stairs cut into the side of the slope. Some days we climbed 900 metres to the temples, and a couple of days we did this twice. Lanterns and cherry trees along the pilgrimage route. 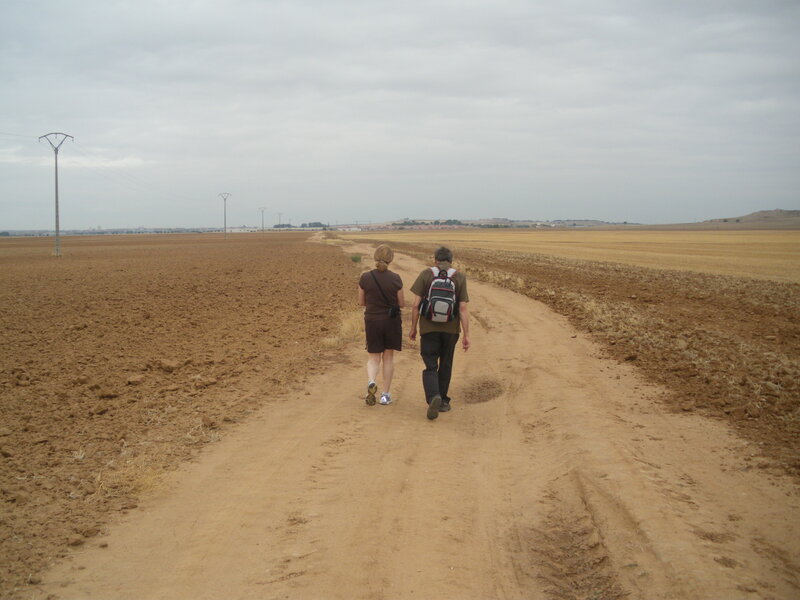 The 88 Temple pilgrimage was much quieter than the Camino Francés, which Wayne walked the following year. “The Camino was a much more social thing,” he said. Most Japanese henro do the pilgrimage in bus tours. Wayne figures fewer than 1000 people per year walk, and he and Jason rarely met other walking pilgrims. The language barrier wasn’t a problem for Wayne because Jason spoke Japanese, but they didn’t meet a lot of English-speakers. There were three other western henro walking the route, and a few people in temples spoke English. The first question they would ask was how old he was, Wayne said. And then they wanted to know where he was from. Pilgrims on the 88 Temple pilgrimage are said to be following in the footsteps of Kobo Daishi. The historical Kobo Daishi probably didn’t have much to do with most of the temples on the route—in much the same way that the historical Saint James likely never set foot in Spain. But the myths and miracle stories that grew up around Kobo Daishi link him to each of the temples on the pilgrimage. There’s a belief that Kobo Daishi travels with every pilgrim as a protector and guide, Wayne said. And a gift to one of his pilgrims is a gift to the great teacher. Local people along the route gave Wayne and Jason gifts almost every day. If they stopped at a 7-11 to buy something, the sales clerk would give them an extra item free. An old woman once gave them money to buy a drink, and someone even gave them a garage to sleep in. One day they were walking through a valley when a pick-up truck pulled up beside them. A hand emerged, offering two boiled eggs to the tired pilgrims. And there was more, Wayne said. People [would] go out of their way to show us a place to camp, and then come back half an hour later with food. No cessation of suffering, and No path leading to the cessation of suffering. Because there is nothing to attain. Wayne still has the accoutrements of a Japanese pilgrim. Henro dress the part, with a conical hat, a white tunic and—when they arrive at temples—a stole. They carry a bell, a rosary and a white satchel, along with the candles, incense and osamefuda (paper with the henro‘s name, address, age, and a prayer) they need for the temple visits. And then there’s the Shikoku version of a pilgrim’s credential. It’s a substantial book, with thick pages, each with hand-drawn calligraphy. At one of the temples. Pilgrims may choose to perform none, part, or all of the temple rituals, and Wayne and Jason chose to participate. They would do the same thing at each of the eighty-eight temples. Each bowed at the gate, rang a large bell, washed his hands, lit three sticks of incense and a candle, put his osamefuda in a box, put a coin in the offering box, rang a gong, bowed, said the heart sutra, recited the Namu Daishi Henjo Kongo (“Homage to the great teacher who brings light to all the people”) three times and bowed. Then they would go to the temple’s Daishi Hall and do the exact same thing again, before getting their books signed and stamped. The entire ritual would take about twenty minutes. “It makes you slow down and pause,” Wayne said. After the rituals, the pilgrims would have a cold drink, walk around and take some pictures, and bow at the main gate. Then, apart from the few times they stayed overnight at temples, they would keep on walking. The 88 Temple pilgrimage is a circle: Temple 88 is near Temple 1. Pilgrims can start at any point—but they are supposed to finish at the temple where they started. Wayne and Jason started at Temple 1. They’d meant to end there, too, but ended up having to head home after Temple 88, leaving their pilgrimage incomplete. They returned in spring 2010 to finish the journey. “Going back to Shikoku last spring was not only necessary, but very satisfying,” Wayne said. He and Jason walked from Temple 88 to Temple 1 over the course of two days, also stopping at several other temples they’d visited the first time. Temple 1 was very quiet, unlike our first visit, and we spent a great deal of time looking closely at the details of the temple that we had missed. After, we returned to Koyasan, the headquarters of the Shingon sect and spent two more days there, revisiting the resting place of Kobo Daishi and thanking him for bringing us safely through, dedicating wooden plaques to my wife, my mother-in-law and Jason’s wife’s grandfather, who passed away the day I arrived in Japan, and getting the final stamps on my scroll. As Wayne said a year after completing the pilgrimage, “journeys don’t end when you leave the path.” The pilgrimage continues to be part of Wayne’s life as he still talks a lot with Jason about their shared journey, and gives occasional presentations about the route. Jason and his wife Maho, who joined the Wayne and Jason for a week of walking. Wayne wrote a great article, “Nothing to be Achieved,” about his experience on the route, which accompanied by more of his wonderful photos. To learn more about the 88 Temple pilgrimage, Wayne recommends the Pilgrimage to the 88 Sacred Places of Shikoku website. Shikoku Japan 88 Route Guide is an English guidebook that can be purchased at Temple 1.